Rocklea is a large suburb of Brisbane & state capital of Qld. If you are living in Rocklea and you have had enough of the unsightly monstrosity that is the junk car residing on your front lawn, don’t despair. There is a solution to your junk car woes. And not only will it be completely free, but you will get money as well. 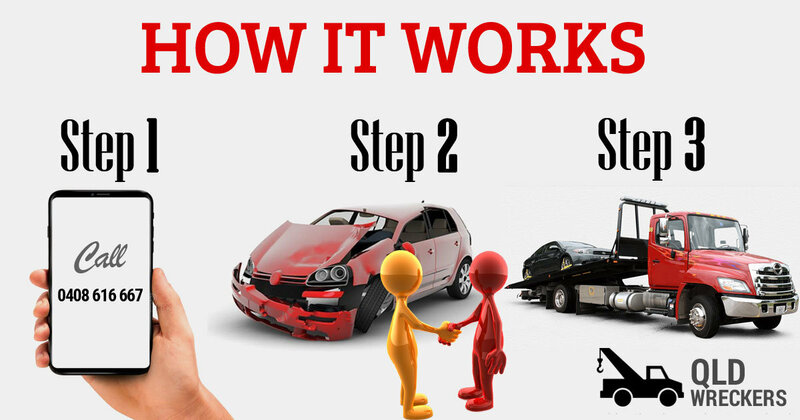 Furthermore, the whole process is the fastest method for selling cars in all of Brisbane. So get ready to get top cash for your old car. Because QLD Wreckers are here to buy it off you. Here at QLD Wreckers we buy all manner of vehicle. We are the premiere Cash for Cars Company in Brisbane, and as such we are proud to pay up to $9’999 for vehicles of all kinds. And we don’t only buy cars either. We buy automobiles of all shapes and sizes. This includes Utes, SUV’s, 4WD’s, trucks and vans. If you have an old or unwanted vehicle that you want to sell quickly and without any fuss. Call us at 07 3393 9929 or fill out the form on our website for a free cash quote. Don’t operate under the assumption that we only buy certain brands and not others. The truth of the matter is that we will buy all brands as well as any and all makes of vehicle. This is because rejecting certain vehicles based on who made them would be bad for business. We also understand that the good fold of Brisbane have cars of all kinds. And we want to make sure that they all have a means of getting rid of their wheels. When it becomes a scrap vehicle. We are doing the whole community a great service that we take great pride in. That is why we buy all makes, not just the popular ones. If you are worried that we will not buy your vehicle because of its make or model. Take comfort in the fact that we will buy your car regardless of its make or model. This includes such iconic brands as a Subaru, Holden, Honda, Isuzu, Nissan, Mazda, BMW, Volkswagen, Mitsubishi, Hyundai, Peugeot, Ford, Chevrolet, Tesla, General Motors and so on. One of the important things we want to provide our customers is convenience. If a customer has a vehicle that doesn’t run, and would cost more to repair than it would to buy a new one. That is why they are selling to us, the likelihood is that if we didn’t remove it for free, they would have to pay to have it moved to our salvage yard. This would mean that the amount of money the customer has at the end of the whole process will be less than it should be. We remove vehicle’s number plates and provide the receipt for department of transport and main roads so you can get vehicle’s registration back. Not only would this cost you, the customer, money. But it is extra hassle and effort that you need to bring to the process. We want all of our customers to get the most money possible. So we will arrange a time to come over to your place after you accept our offer and we will have a closer inspection of the vehicle. Then we will pay you cash on the spot before using our auto removal equipment to take your machine off into the horizon. You don’t have to pay a dime, and there are no hidden charges either. There isn’t a location in QLD that we don’t go to in order to serve our valued customers. Some of the areas that we go to are: Warwick, Mound Isa, Mackay, Emerald, Yeppoon, Bongaree, Rockhampton, Toowoomba, Gold Coast, Nambour, Townsville, Cairns, Sunshine Coast, Bundaberg, Hervey Bay, Gladstone, Maryborough, Tingalpa and Gympie. The kind of vehicle we often buy is the humble scrap automobile. These are the cars that are no longer in working order, and the cost of repair would break the bank. With the result being a vehicle that isn’t worth the amount you just spent getting it up and running. So it is better to simply replace the vehicle with a new second hand one. But you still have to get rid of the old one, which is where we come in. So it makes sense that the junk auto you sell to us is going to be in bad condition. There is no such thing as a junk vehicle in great condition. And we don’t expect anyone to clean their scrap car or make repairs on it so that we will be more likely to buy it off them. Global warming is occurring. And the main driver of this slow moving calamity is carbon dioxide. Here at QLD Wreckers we take pride in the fact that by recycling all the steel on a vehicle will help the environment. Because the recycling process uses up less energy resources than the mining process that is used to get the raw materials that steel is made up of. And as we all know, carbon dioxide is produced by the use of energy resources. Resultant, our car scrapping & dismantling services saves the environment unconditionally. Furthermore we also make sure that we dispose of any and all toxic materials present in your average vehicle. Otherwise they will get into the local environment and play havoc on the wildlife and plant-life. You can rest easy knowing that your automobile won’t be causing any further harm to the planet after you sell it to us. Are you currently on the lookout for a specific auto component with which you would use to make your car able to transport you to work each morning once again? Then look no further than our giant range here at Qld Car Wreckers. We sell the best used spare parts at competitive prices. Call now and book that part that you need to make your car run again.